Author(s): Ashis Bhattacharjee. Department of Physics, Institute of Science, Visva-Bharati University, Santiniketan-731235, India. 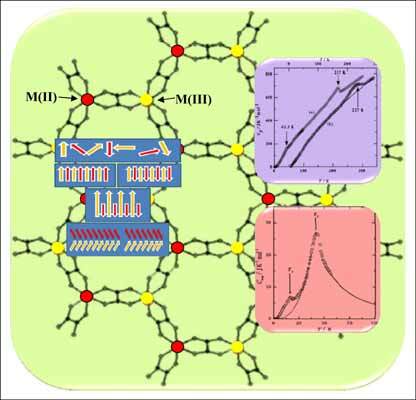 Oxalate-ligand based two-dimensional bimetallic molecular materials of general formula A[M(II)M(III) (C2O4)3] have drawn much research interest in the field of molecular magnetism. In this article, these materials and their magnetic properties have been introduced. The heat capacity calorimetric studies on these magnetic materials reported so far have been revisited to highlight the scope of application as well as the importance of the thermodynamic technique - heat capacity calorimetry in the field of molecular magnetism. Keywords: 2D-magnets, bimetallic complexes, compensation phenomenon, heat capacity calorimetry, lattice dimensionality, magnetic transitions, molecular magnetism, oxalate ligand, spin glass, structural transition. Affiliation:Department of Physics, Institute of Science, Visva-Bharati University, Santiniketan-731235, India. Keywords:2D-magnets, bimetallic complexes, compensation phenomenon, heat capacity calorimetry, lattice dimensionality, magnetic transitions, molecular magnetism, oxalate ligand, spin glass, structural transition. Abstract:Oxalate-ligand based two-dimensional bimetallic molecular materials of general formula A[M(II)M(III) (C2O4)3] have drawn much research interest in the field of molecular magnetism. In this article, these materials and their magnetic properties have been introduced. The heat capacity calorimetric studies on these magnetic materials reported so far have been revisited to highlight the scope of application as well as the importance of the thermodynamic technique - heat capacity calorimetry in the field of molecular magnetism.